Good morning and welcome back! It's Cassie here today, and I've got a fun fall card to share with you today. I've been itching to make more fall-ish cards. Today's card could really be given at any time of the year, but it does lean more towards fall look in my opinion. Let's take a look at it! I used a technique that I saw another crafter use on Instagram where you die cut a bunch of objects, in this case leaves, and cover your card front with them. I love this technique because it really makes use of the dies that I sometimes forget about, or have trouble using a lot. 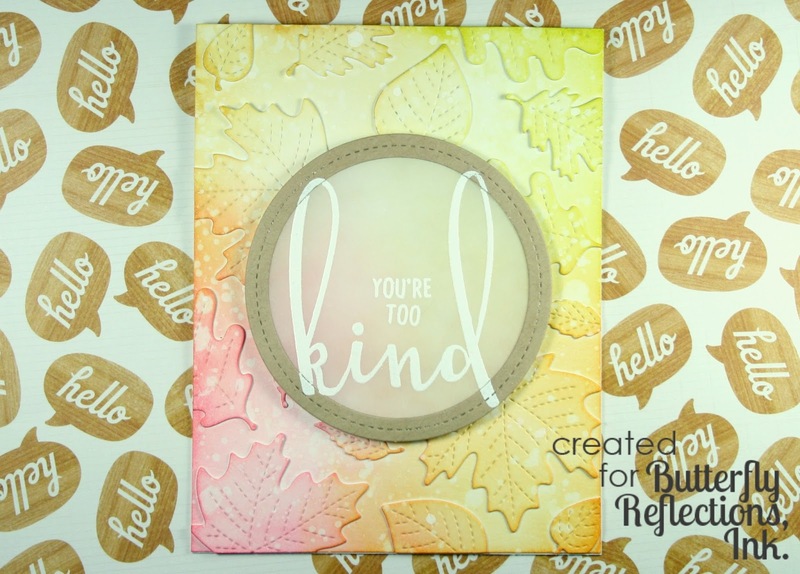 The leaves I used for this card are Lawn Fawn's Stitched Leaves. They are the perfect size for filling the card front! After I die cut them and attached them to the panel I trimmed any overhang and got out my Distress Inks. I blended in Worn Lipstick, Dried Marigold, Mustard Seed and Crushed Olive with a mini ink blender. I used a really light hand here to create softer colors, instead of the deep fall ones that are typically used. Of course, I had to add water to the card to give the bleached splatter look that I love. Next I used the Single Stitch Line Circle die from My Favorite Things and die cut from some kraft cardstock. I also cut out a circle out of vellum to fit behind the stitched circle. I used my powder bag on the two pieces because I knew I wanted to heat emboss on them. I pulled together a sentiment from the Kindness stamp set from Honey Bee stamps, which I've been so excited to use, and stamped it on the circles using VersaMark. 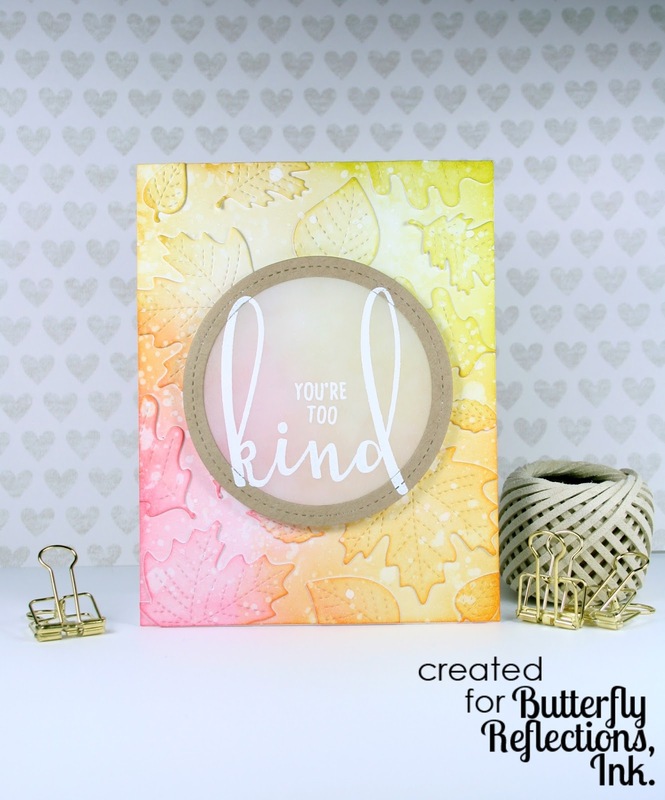 I heat embossed the sentiment using some white embossing powder. After that all that was left was to apply some foam tape behind the kraft cardstock and attach it to my card front! Thanks so much for stopping by today! I hope you liked the card, and we will see you again soon with another card! This is a gorgeous card Cassie ! I am in love with the technique , the colors the whole design !! I am inspired to try this ! Thank you for the beautiful creation ! You make it sound so simple! Mine would be a mess lol. Love this!